Saturday May 28th 1898 I hurried through with the work and Will and I went to town. I walked over home and in the afternoon Mother and I walked down to Robinsons to spend the afternoon with Lizzie. Will came after us. I did evening work, went to bed. 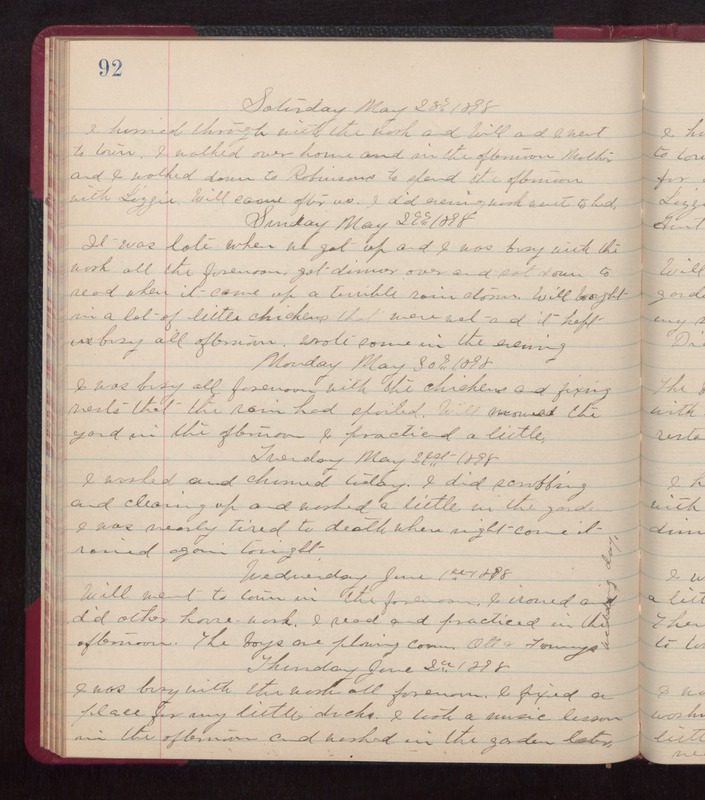 Sunday May 29th 1898 It was late when we got up and I was busy with the work all the forenoon. Got dinner over and sat down to read when it came up a terrible rain storm. Will brought in a lot of little chickens that were wet and it kept us busy all afternoon. wrote some in the evening. Monday May 30th 1898 I was busy all forenoon with the chickens and fixing nests that the rain had spoiled. Will mowed the yard in the afternoon. I practiced a little. Tuesday May 31st 1898 I worked and churned today. I did scrubbing and cleaning up and worked a little in the yard. I was nearly tired to death when night come it rained again tonight. Wednesday June 1st 1898 Will went to town in the forenoon. I ironed and did other house work. I read and practiced in the afternoon. The boys are plowing corn. Ott & Fannys wedding day. Thursday June 2nd 1898 I was buys with the work all forenoon. I fixed a place for my little ducks. I took a music lessons in the afternoon and worked in the garden later.